Farkle Dice - Free and Farkle Dice Deluxe (Ad-Free) are two popular and well-reviewed apps in the Amazon Appstore for Android. Developed by Smart Box Games, the apps present a fast-paced dice game and offer both solo and social gaming experiences. 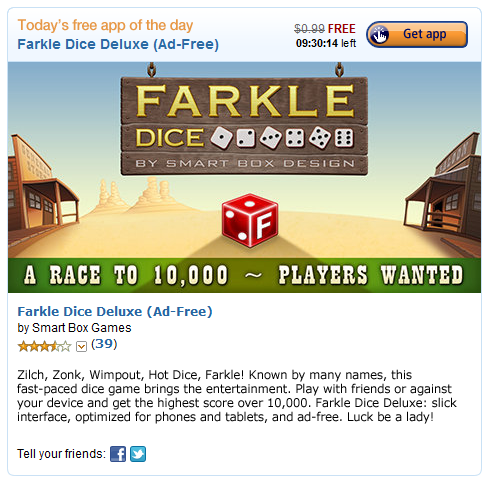 Within a few weeks of its publishing, Farkle Dice - Free skyrocketed to the top of the Board Games category and soon climbed the charts under the Top 100 Free Bestselling Games.